​The proportion of California kindergarten students who received all required vaccines at the start of school increased a year after the state eliminated nonmedical vaccine exemptions for school entry - but not without problems reported by health officers, according to a study published in the November 2018 issue of Pediatrics. 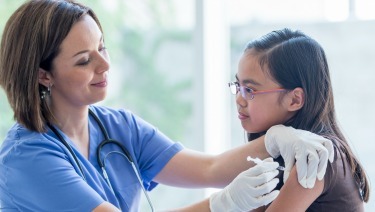 The study, “Experiences With Medical Exemptions After a Change in Vaccine Exemption Policy in California,” describes the experiences of county health officers and immunization staff following the 2015 passage of Senate Bill 277. That year, California became the first state in nearly 35 years to eliminate nonmedical exemptions from school-entry vaccine mandates, joining Mississippi and West Virginia as the only states to do so. In the two years following implementation of SB277, the proportion of kindergartners who received all required vaccines increased to 95.1 percent in 2017-18, up from 92.8 percent in 2015-16. But, the rates of medical exemptions in California increased 250 percent, from 0.2 percent in 2015-16 to 0.7 percent in 2017-18. The authors, who interviewed 40 health officers and immunization staff, representing 35 of the 61 local health jurisdictions in California, highlighted their experiences with implementing medical exemption provisions under Senate Bill 277. The study revealed concerns about reports of physicians who advertised medical exemptions online for a fee and the impact this could have on the long-term success of Senate Bill 277. The authors suggest that without additional changes to the law -- including a standardized review -- medical exemption rates could continue to rise in California.